I'm not sure why someone would leave stencils on the ground, but it made for a cool photo. First shorts, now pants? I'm not quite sure what has gotten into me. I've been searching for a reasonably-priced pair of wine-colored pants for some time now and finally found these on clearance for $20 at Target. On Saturday, I went to an apple orchard a couple of hours away with T.J.'s family and afterwards, he and I decided to go fall clothes shopping (he's trying to be more stylish. I swear I didn't even have to convince him) since we were pretty close to a bigger town. We only ended up getting to a few stores, but we both actually had really good luck at Old Navy and Target of all places. Somehow, I ended up with two pairs of pants (the other is a pair of dark teal cords) and not a dress or skirt in hand. I'm branching out and it's a little strange. I really need to apologize for being such a terrible blogger. I had planned on blogging yesterday, I really had. I even had a "new post" tab open all day with photos in it. However, Tuesdays are not good days for blogging for me. I have class until 1:45 and I usually go into the newspaper office around 3:00, where I am until about 11:00. I was hoping to have time before I went in, but I had to transcribe a 45 minute interview, finish writing a story, and edit about five of my writers' stories. Production days are long days. I only get through it because I love my job so much. Plus, we've had two controversial news stories in this past week, so it's been pretty exciting in the office. Controversy for journalists is like crack. Thank goodness my public speaking class was cancelled today so I have time to do this. Hopefully I can be a better blogger this week, but if not, there's an exciting project in works that will make up for it. I can't wait to share soon. Also, my friend Jennifer took these photos again, which is why they're so great. I'm considering kidnapping her and enslaving her as my personal photographer. Too much? Your burgundy pants are so cute! Love this entire outfit! You look so adorable in these and I can't wait to see the teal cords in action too. The pants are amazing, I love the color! I hardly ever wear pants on the blog either, although I wear extra stretchy skinny jeans about every other day because they are easy to bike to work in haha. 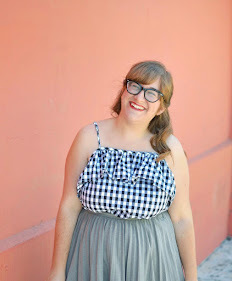 If I had ones as cute as these I would for sure be wearing them on the blog! Good for you branching out! anddd, I spelled my own name wrong... One of those days! I love these pants on you, the color is gorgeous. You look so super cute! Old Navy is always a winner! I guess these pants are from Target...Target is always a winner too! And I'm excited to see your ON finds. A day at an apple orchard sounds lovely and quinessentially fall! Jealous! Man your Tuesday is full! Don't worry about blogging, posting less makes you more mysterious and chic anyway ;) I love that white blazer too! It's very unique-looking. I 100% love these pants on you! A truly wonderful color. That top is darling! I buy so much clothes at Target. I have to say, their clothes are pretty amazing and you look amazing too! You've been quite the busy bee!